I would like to pre-register for this event. We are coming from Vancouver Island. Cannot figure out how to do so. I hope we can cross the border from the U.S. into Canada in the year 2018. Th U.S. is looking a little bleak these days. Looking forward to joining y’all (or “you guys”)!!!!! Firming up plans now to attend this event in Winterpeg, August 15 – 22nd, 2018. Since I will be coming from Vancouver Island, and I want to see Eastern Canada as well, I have decided to head to Newfoundland Labrador in mid-May. Then return from the Maritimes to Winnipeg in time for the event in August. Are there any fiberglass trailer groups (Boler or otherwise) that are planning to convoy from the East? I would be interested in joining for the trek. Any links to these groups would be appreciated. Thanks in advance. Travelling in a 2004 Trillium Outback – 13 ft. towed by a Toyota Tacoma. Now that would be a cool trip! I would love to see Eastern Canada also. I really hope to be able to do it in the future. Hi Barbara, there will be caravans and suggested stop overs…more details to come…planning is happening! http://boler50.proboards.com for route information. It is being updated as spots are confirmed. Thank you, we hope everyone has a lot of fun!! Sorry you can not make it, I have deleted your registration. Thanks Ian for all your works. have same first name like mine but not showing last name and they all come from same city, and they all have Boler…..
Would you please advise? Thank you so much! Don’t worry Eric, the pre-registration was to identify what interest we had and from where. Very soon a reservation system will be launched where you can purchase event passes and guarantee a place for your trailer at the event. We have tried twice to register but still don’t see our names on the list. Are we doing something wrong or is the website not working? There seems to be a few problems with registering using certain devices, but please don’t worry. We will be launching the actual registration site very soon (on a different and professionally developed platform) where you can actually register for the event and book your site just like buying tickets to a concert. What an awesome idea. Can’t wait to take part! Great ! Hope to have my reno work done by that time ! Hi Abby, travelling from the Melville/Yorkton area of Saskatchewan…. where are you located…. hope to meet many new friends…. Ian, how can we ever thank you enough for leading this historic adventure! We hope to join in a little east of Vancouver. I have had my egg for about 15 years. I have slowly fixed it up and am getting ready to use it a lot. This caravan is an awesome idea! If my health holds I will attempt to attend end to end east to west. My Boler is an American built in Wichita Falls 1972. I will look forward to attending. I think we’ll need a week to see them all. How about two weekends with the week in between? I will be fulltiming by then, hope you do this when it’s warm? I can’t wait to hear more about this!! I have a 1979 boler and I am really enthused about this celebration. Plus I haven’t been across Canada so I live in Halifax, NS and it would be a blast to do this. Yes! Thanks for the opportunity. Sharon,,,i have a 1980 and just seeing this event and sounds pretty cool,,,i live in pictou county N S now this got me thinking to do this !!! If the health holds, we hope to try to join the caravan from Ontario to Winnipeg (I have family there). We took our antique car and boler across Canada in 2000 for the millenium “Coasters” tour and it was wonderful. We’ve also done the Earlton, Ontario run, and attended boler meets here in Ontario, Quebec and the maritimes. We are the organizers of EggFestOntario in Grafton, Ontario at the end of May and really enjoy meeting other Egg affictionados. Hope to see you in Manitoba in 2018. We’ve always wanted to be a part of a “Bolerama” type of event so this is right up our alley. We have pulled our Boler from the west coast to Winnipeg twice now and will look forward to this group excursion. Our family currently has three Bolers and a Trillium but it will be a Trillium crossing for us in 2018. So looking forward to this event! Please keep us posted! Bert the Boler wants to play! We are not a Boler but a proud Trillium owner. We can hardly wait to take part of this historical event. We will be traveling from the Interior of British Columbia. We heard about this event at the BC Glass Egg Event this past June. We have you on our calendar. Any idea yet where the “muster point” will be in Winnipeg? We plan on driving from Newfoundland with our Boler for this. We can’t wait! I see you have “events along the way”. I am fairly certain I could sweet talk my brother in to allowing us to put on an event on his acreage just outside of Cochrane (Calgary)! Our first experience in joining a Boler group. Hope everything goes well! We will join the caravan from Mont St-Hilaire Qc. See you all!! We attended our 1st PrairieEgg Gathering in Manitou Beach Sk. on July 17th 2016 after purchasing and renovating our boler a year prior to the event. We had a blast meeting everyone. What a great group of people. Fun Fun Fun. We also looking forward to next year’s gathering aswell aswell as the 2018 boler caravan to Winnipeg. Please send us info. as it comes available. We can’t wait! My hubby and our good friends, even my mother and father in-law want to make the trek! You’ll have a large contingent from Vancouver Islands – Island Bolers and Friends Association going! It was all we could do to contain our excitement at our Fall meet just this past weekend as we all talked about how wonderful an opportunity this will be! As my address in Wpg in 1968/9 was 711 Dufferin I first saw the Bolers in the outside storage yard while crossing the Arlington Street bridge ( factory was just to the s.w. side of Dufferin and Arlington. Owned and extensively toured a ’73 for years but now travel with a wonderful 17′ Escape. For this event will definitely try to borrow back the Boler and join in Victoria (live on Vancouver Island) for the eastward journey. Should be a blast ! , anyone thinking of a route down From Edmonton ! possibly meet up in Regina ? I will be coming from Grande Prairie, it would be fantastic to convoy! If anyone further north is coming through GP, I could tag on and then we could pick up as we progress online the route! It would be great fun!! http://boler50.proboards.com for caravan route info. Site is being updated as spots are confirmed. I am looking forward to this event. Hoping to travel with others from Vancouver Island..I live in Victoria B.C and will be driving Solo. We will be happy to travel with you from Victoria. There will likely be others as well. It will be epic! a watching out for each other and our wee trailers- so much fun!! Have you connected with Island Bolers and Friends yet-they hhave gatherings twice a year and are on Facebook. I’m also in Comox! Yes, I’ve been to the Island Bolers & Friends meets, just not this last one in the Fall. I have a 2004 Trillium Outback – one of the newer f.g. trailers in the group. Still lots of work to do on it after taking it on a 10,000 km journey to Inuvik, NWT, and back over 3 months last year. Punched a hole in one side on the front from rocks (I like going off-road ! ), rattled 3 of the 4 windows loose, damaged my propane lines underneath, and a few other minor issues. But I’d do it all again in a heartbeat. Tough little units. So, I have some time to do the R & R before this trip. What type of trailer do you have? I don’t know any other owners in the Valley. Convoy to Winnipeg, and beyond, hopefully for me. I, so far, will be travelling solo. Maybe we could get in touch somehow beforehand? You could send me a PM on my Facebook page under this name. I hope you make the boler documentary available to us at the Winnipeg Event. Have seen it at a couple of rallies, but never able to buy one. JJ Know what I am talking about. THANKS! Knew this anniversary was fast approaching but wasn’t certain anyone had jumped on the organizing bandwagon….so glad to find this site and learn of this upcoming celebration. Dennis and I have registered and are coming from Moncton NB. Hi to Vivian and Paul Parkin!!! Hope this finds you well. We were considering making a circle tour with wintering across the southern US and spring-time travel up the west coast to try to coincide with the trek across country from Victoria. Will follow this blog to see if it is even going to be feasible. Otherwise, we’ll simply head west from home here in the Maritimes. Perhaps a caravan of Maritimers would be fun…. I’m in. Heard about this in June at the Island Bolers meet in Nanaimo, B.C. It seemed that there were quite a few people who wanted to join in. And a few that wanted to continue on East to Nfld. Anyone else on here interested in going East from Winnipeg? With the event being held Aug. 15 – 21st it makes it late for continuing on East and then returning back to the West coast. Of course there’s the option of dropping down through the States where the weather is usually better in the Fall. All food for thought. I might be interested in the eastward continuation as I’m just starting in Regina. Be great go keep rolling. Am so looking forward to joining this caravan from west to east! We live in south western Ontario and would like to join the group and travel/camp with fiberglass campers for a portion of the trek. Not sure what portion we would hook up with but I guess we have time to sort that out. We have been to Macklin SK once and take in three meets in Ontario each year. Looking forward to meeting kindred spirits. any chance dates will be set up by November 2017 . I have to schedule vacations by then. thanks 1972 Boler owner .. Tried to register several times but I get an error message. I think others might be having this problem too?? Thanks for doing all this for the caravan. yes, I sent a msg a few days ago. I am on Vancouver Island. Sure would love to take part in this but time will tell. I know my 1967 Vanguard Truck Camper is not a Boler but thought I might borrow one for the trip in order to take part.. In the mean time, would you please spread the word for this [email protected] that the Maritime Vintage and Fiberglass Meet is happening on the 4th,5th and 6th of August 2017 in Abrams Village PEI. Many thanks to you all, and I am going to be thinking hard about taking part in this great event thatyou are going to have happening in Winnipeg. To one Proud- Canadian from [email protected]. Karl Proude Host of The 12th Annual Maritime Vintage and Fiberglass Camper Meet in Abrams Village PEI August 4th,5th and 6th 2017. What a great idea and how hard am I thinking about trying to make this event,like 99% of the time. But will I be able to take my 1967 Vanguard Truck Camper.I know I will have to borrow a Boler. I am cool with that. Wishing you all the best on your event and I know it will be a blast. As a Proud Canadian 🙂 I look forward to you and a bunch of the Islanders joining us for the event. Please make sure you pre-register so we get an good idea who would like to come. Just registered. What a FANTASTIC idea! I am hoping to make it but wondering if you have any idea as to timing? Have family coming from Europe that summer (July) so want to make sure these two events don’t collide. Hi Ian I thought I pre-registered on November 14 but not seeing my name on list. Tried again today (a couple of times) and it just bounces back to top of pre-registration page. I received an email in November re: Confirm your subscription for Boler 50th Anniversary 1968-2018 which I did. A rough tally looks like you are already up over 250 registrants. What’s your limit? Yes we currently have over 260 trailers registered, I am anticipating we could have close to 1000 attend. I will be driving up for my 50th birthday with my 1972 Boler made here in Wichita KS . Just happens to be the same week !! Hello! i do not own a Boler, though i was really trying hard to find a Boler or an old Scamp before i bought my 2014 Scamp. I am planning on coming down from Wasilla, Alaska.. Will anyone else be traveling from that direction? Also, will pets be allowed? I have two small 5 lbs terriers an a 25-30 lb blue heeler mix.. Very excited to see so many trailers and meet new people! Hi Elizabeth, Love for you to join in, currently there is one other registered in Alaska from Anchorage. Pets are allowed but there will be a leash required. Hello! We just registered and wondering when the list will be updated? Thanks, Carol and Paul from Mont St-Hilaire, Qc. Hi Carol & Paul. The website participant list updates automatically in real time, Usually just takes a minute, then if you refresh your browser the list will update. The list is alphbetical by city, I check and you are there 🙂 Thanks for registering. Hi Ian! We signed up for pre-registration and got the email confirmation, but we aren’t showing up on the participants list! We have a 1974 Boler and are very much looking forward to joining (hopefully picking up with the caravan from the eastern US). Welcome and don’t worry, your registration is there, Just takes a few minutes for the server to clear the cache. Has anyone reached out to Canadian Tire about becoming a major sponsor ? Hello Robert Thank you for the suggestion. Yes I have reached out several times to both Canadian Tire and their primary charity (which proceeds from this event could support) and like most of the dozens of contacts I have made there has not been any responses. We have been looking for a Boler, Trillium, Scamp, Casita for 4 years to purchase! We’ve just Retired and would love a trip like this and we also drive from Wasington State to Wisconsin every year to see Grandbabies! Our 35 foot Winnebago Adventurer just would be too too out of place but the potty and shower would be handy! LOL. How does one purchase one? There are 2 options to become a moulded fibreglass trailer owner. First is the used market, even though these trailers have been made for many years their availability is limited, this means when one comes up on the used market it sells for a relatively high price and will sell quickly. You also will probably have to do some repairs on a used trailer, the great thing about moulded fibreglass trailers is that anything that goes wrong can be repaired, although the time and cost depends on your talents and skill. The second option is to buy new, this has the benefit of you being able to get exactly the options and floor plan you want, the down side is the price and often there is a long waiting list for delivery. All fibreglass trailers are sold out of the manufacturers facility, the production costs of these are higher than standard trailers so to keep the price competitive they have to eliminate the “middle man” or dealer. A great option for you would be to attend a local fibreglass RV Gathering, most are well attended and there you can see first hand the different models and talk with the owners. It would be amazing to book downtown Revelstoke for a “show and shine” day for those travelling through here. Please let me know how i could help with this. I would need a date to suggest to the city. That sounds like a great idea! A couple of us from Kelowna, will be joining the caravan in Revelstoke. I believe the proposed date would be Saturday 11th. Ian. We found ours in cottage country two years ago where it had been used as a spare room for overflow on the weekends. I know there are a few more around our lake still used for that purpose, ours had not been moved for years. Barrie B.
Eastman Tourism is one of six rural tourism associations in Manitoba. If participants are not interested in exploring Winnipeg we would be happy to tell them where to go, things to do and see and places to eat in Eastern Manitoba. Visit http://www.eastmantourism.ca for more information or email us at [email protected] for a copy of our visitor guide and other information to include in your registration package. What an exciting event for Manitoba! Makes me want to get a Boler now. Happy trails! Because I’m from Winnipeg already, I am thinking of driving out to maybe Thunderbay to get in on one of the convoys for the ride back to Winnipeg. I think that would be an amazing experience!! Hi Ian: Merle McKever is thinking of having a rally in 2018 maybe to co-ordinate with your tourers. She is looking into Mcrae Provincial Park here in Ontario. I have sent her your contact and your date so you will probably hear from her. Sorry we are not up to making it next year. I realized after getting home today from EggFest that a simple weekend just an hour from home has completely worn me out. Good luck on your venture. 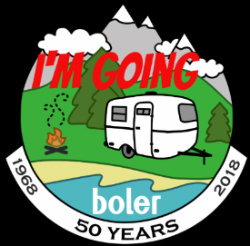 We have been thinking about the Boler Anniversary next year, trying to see how we could merge with campers coming from the east coast on the way to Winnipeg. We live in southwestern Ontario and can’t envision travelling to northern Ontario at that time. I was wondering if there were a number of fiberglass units planning to take a more southerly route, perhaps travelling partway through the states. If so, do you think a meet and greet in our area with a “window“ of 4 to 5 days might be useful. There are conservation areas around here which offer group camping that might be suitable. Hi Lew and Wendy. I’m in Waterdown (north of Hamilton). Yes the proposed northerly (from Montreal) route is way too far north for me. I’ve left a comment on perhaps a secondary group of us going through Perry Sound – Sudbury and around Superior. We’ll wait to see what they have to say. I just looked at the interative map – I get what you’re saying. There are a bunch of southern Ontario folks that could travel through western Ontario, into the States and up to the Sault. Tag up with the mid-Ontario folks and travel over Superior together. Hmmmm … makes for an interesting discussion and definitely fun trip! Should we book campgrounds along the route ourselves or is this going to be part of the registration? I have registered just don’t see me listed yet , not sure how long it takes . Also would love to connect with any of the local Boler owners in the Georgian Triangle Area. Hi Abby, your name is on the register, can take a short while for the cache to reset. Ian, I would like to suggest some demonstration/information seminars…. specifically, I would love to take a hands-on seminar involving disassembling and reassembling jalhousie windows ! We are terrified to do it ourselves! Not sure if I can make it at this time, but I love the idea and will be excited to go if the chips fall in the right place. I would like to know if you’ve contacted “Princess Auto”. Man I can’t tell you how many times I’ve visited them for parts. I have a 73′ 1300 Boler and I think most of the replacement parts are from these guys from Hitch to tail lights. Thanks for your suggestion, yes Princess Auto was one of the first companies I spoke with about sponsoring our event, unfortunately they decided not to participate. https://www.armadillotrailers.net/ / / these folks would be a perfect sponsor . . would you like me to contact them for you , ?? Hello Ian—–We are pre-registered, from Moncton, but will be heading west earlier–in mid July most likely–having family to visit in the Peg. We both are MORE than willing to assist you in ANY way —-please feel free to reach out to us. From what I can see so far of your plans, this is going to be an incredibly fun time! Great work —and thanks for organizing it all!!!! We have registered and received a ‘Thank You’ but not on participant list yet. Anyway, traveling from Texas so please feel free to give my contact info to anyone who may want to caravan together. We just registered with our 1967 Eriba Puck made in Germany, made to be pulled by VW’s. We pull it with our 1967 VW Westfalia camper. We’re excited, this is a huge event, we’ll be traveling from Austin Texas, we actually see a ot of Texans have registered, hope we can cooridinate and cruise together. Ontario is a BIG province! I see a few people from southern Ontario. Maybe we can travel together up through Perry Sound – Sudbury and around that big Superior and catch up with everyone after that? Is it possible to attend with trailer for just the weekend? I would really recommend that you plan to attend the full event, Aug 15 to 18 (leaving on Aug 19) but if you cannot attend the full event yes you can attend with your trailer for just the weekend, but because the tickets are for the event you would still have to pay the site fee and and purchase an event pass, we cannot offer any discount for shorter stays. Hi Ian, hope all is well. Its been a long time, this is Roland Hoffman, I started the Manitoba Fiberglass Rally and we met at one of the early rallies we had in St Malo some years back. Not sure if you have a place but If you are needing to make any more organizing trips to Winnipeg I just wanted to offer you a place to stay in our home and possibly a car if needed to help in your organizing and meetings…. If interested we can set you up with keys and you can come and go as you like, take care, great work and see you soon! Great to hear from you Roland. WOW what a generous offer, thank you so much. The event is coming together very nicely, the majority of the organizing has been done, now we need to collect money so we can place deposits on facilities, equipment and bands to and confirm their attendance. I have been keeping Rick updated on the event and we may need your help as the event gets closer. At this point I am hoping I can manage all the organization remotely from Calgary, but if I do need to travel to Winnipeg I will contact you. I will be joining the BC/AB East Caravan in Calgary and bringing up the rear acting as mechanical support for anyone that finds themselves with an unfortunate (Minor) breakdown, flat tire, wiring problem etc. I will be bringing a large assortment of hand and power tools, floor jack, air compressor, spare wiring, light bulbs, water for radiators etc. and will aid in any repairs that are necessary to get you back on the road. I’m sure the other Caravans could benefit from having someone volunteer their skills in this same capacity. Thank you Brian, appreciate this help for everyone. I see there is now a merchandise section for the 50th anniversary coming up. I looked and saw an anniversary pin. Another idea would be an anniversary patch or sticker that could be put on the camper itself. Just purchased our Passes. We have been looking forward to this since talking to couples in Banff last summer. This will be our first and apparently largest Boler event. It was a present from my Mother and youngest Son. Regrettably my Mother just passed away this past Thursday, so I won’t be able to share what we believe will be one of our great experiences in this little Manitoba invented and built traveling wonder which we call our Boler. Hope to meet and make some new friends this August. Ian will we get physical tickets? Or just the print at home? Hi, I have seen people mention a participant list. Can you tell me where that list is. The participant list people are mentioning was a “pre-registration” list of those that identified they would be coming, The list closed Dec 1, 2017. I will be publishing an event participant list soon. Ian, your trailer is so shiny! Do you have any advice or preferred product to buff up my Boler? Thank you for your kind comments. The best products to use on your boler are the same products used for fibreglass boats. My favourite line are the Meguiar’s line of marine deoxydizers, polishes and waxes. My boler has been painted so that contributes to much of the shine but you would be surprised at how the marine products will get your trailer, albeit there will be some work involved. Ian, For those of us visiting from the US – will the food trucks and concessions take US money or will we need to have Canadian currency? I see there is a trolley city tour company in Winnipeg. Any chance of setting up the trolley to take optional tours for anyone interested at 4:00pm or so on Thurs & Fri afternoon? Obviously we would each pay for the tour if we chose to take the tour. It would be best to exchange some of your US money for Canadian, I am not sure about the food trucks but many stores will accept US funds but you will get a far better exchange rate if you convert to Canadian. I will look into the Trolley Tours and see if they would even pick us up at Red River Ex, just remember that on Thursday afternoon we have the Wine & Cheese Social and on Friday afternoon is the Beef-on-a-bun dinner. Thanks Ian for the reply. I put 4:00pm but really whenever the demonstrations are over. Maybe 3:00pm? I don’t drink alcohol so the missing some of the wine and cheese social would be fine with me. Just an idea not a deal breaker. Any stickers or key chains to commerate the 50th anniversary? I collect both. What is the camping going to be like? Are there bathrooms and showers available? The Exhibition Park will be converted to a campground for the event, One of the main reasons I selected Red River Exhibition Park is they have the facilities to host a gathering of this size. Each site will be 20′ wide and between 30′-40′ long, there are 4 main restroom buildings with multiple toilets in each, I will also be bringing in additional portable toilets to make sure there is always a bathroom near. Two custom shower trailers will be on-site that contain a combined 38 shower stalls are being brought in to ensure everyone has access to free showers. Yes I will update the participant list in early July to also include everyone who is registered from February through to the end on June. I apologise for getting behind on updating the list. I purchased a main site fee and event pass on Feb 2 Order 164058. My spouse is now able to attend however I do not know how to include her without buying another main site fee. Can you help me out? I am gluten free/Celiac, so I was wondering if there will be gluten free options available. I think the main one I was thinking about was the BBQ dinner, I can bring my own bun, but was wondering if the meat will be gluten free? I thought I would ask ahead of time as I plan what I’ll be able to eat for the week. Thank you! Hi Ian, another question. Hopefully it hasn’t been asked and answered already. For those of us that have trailers with holding tanks, will we be able to fill our tanks in the Park, or should we plan on doing that ahead of time? Also don’t want to hold up the caravan entering. Hope this makes sense. Thanks for your time and patience! There is water available throughout the park, we don’t have hook-ups for every trailer but bring a hose and taps should be close enough to fill your fresh water tanks while parked in your site. How about the other end, will there be a dump station available? I wouldn’t want to drag my camper around the grounds but could bring a portable waste tank if it would be worthwhile. Have there been any concerns or changes with the Eastern Caravan route regarding the forest fires in northern Ontario? Can you use charcoal in a grill or is that banned totally want to use my dutch oven to cook. I would like to talk to any former Boler employees that worked at the Dufferin location…..